Barry Jozwiak was the first person selected to serve as the state representative from the 5th Legislative District after it was moved from Northwestern Pennsylvania to Berks County in 2014. Barry supports the complete elimination of property taxes through the adoption of a system that would more fairly fund Pennsylvania schools. Barry is a small business owner and supports policies aimed at creating family-sustaining jobs in Berks County and across Pennsylvania. He backs education funding reform and is dedicated to fixing Pennsylvania’s broken public pension systems. Barry’s commitment to public service has been a constant part of his life. He is a U.S. Navy veteran, served as the Sheriff of Berks County for 12 years and was a Bern Township Supervisor. He served 25 years as a member of the Pennsylvania State Police and is a former president of the Pennsylvania Sheriffs’ Association. Barry enjoys the outdoors and is a strong supporter of the Second Amendment right to bear arms. He serves as a National Rifle Association membership recruiter and belongs to the Ruffed Grouse Society, Ducks Unlimited, Leesport Gun Club, Northkill Rod and Gun Club, Strausstown Rod and Gun Club, Rocky Mountain Elk Foundation and the Shartlesville Fish and Game Association. He is a member of the Pennsylvania Farm Bureau and supports the important heritage associated with farming while recognizing the important role it plays in the Commonwealth’s economy. 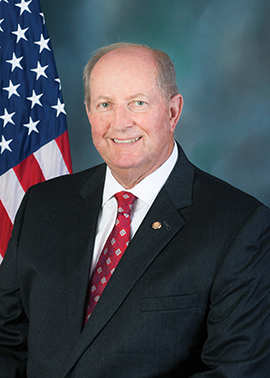 Barry currently serves on the House Judiciary, Veterans Affairs and Emergency Preparedness, Game and Fisheries, and Aging and Older Adult Services committees. Barry received an associate degree in community services and a Bachelor of Arts degree in law enforcement and corrections from Penn State University. He also attended the Louisiana State University Academy of Counter-Terrorism Education. During his time in law enforcement, Barry participated in the National Sheriff’s Institute executive development program. Barry and his wife, Margie, have been married for more than three decades and have one daughter and two grandchildren. He is a member of Grace Lutheran Church and a lifelong resident of Berks County.